Home Opinions	You are what you eat, right? Packaged goods and frozen meals are disappearing from the shelves in Europe, however, it’s not the consumers who are responsible. After the Food Safety Authority of Ireland released a press statement in January that some burgers had tested positive for horse and pig DNA, products from a number of different companies all over Europe have been recalled. It has left many with a sense of distrust towards the food industry, especially since many brands such as Burger King, Taco Bell and Nestlé have tested positive for tainted meat. Although the culprits have not yet been identified, investigators suspect that slaughterhouses in Poland and Romania are involved in the scandal. There have also been arrests at the Peter Boddy abattoir in Yorkshire, England. So far there’s a lot of he-said-she-said, coupled with finger pointing in all sorts of directions, but no one is stepping up to take the blame. The meat industry isn’t a straight line from slaughterhouse to the supermarket anymore. According to an article published in The Guardian, “there are around 450 points at which the integrity of the [supply] chain can break down.” So think maze, not straight line. The irony with this scandal is that many consumers are aware that meat has become ambiguous. It has come to include a multitude of additives, some of which the pronunciation of is exhaustive and confusing. When you buy supermarket “meat,” chances are it contains maybe 80 per cent actual animal. And that’s being generous. In the UK, burgers that contain at least 50 per cent beef are considered legal. So, it isn’t so much that horse meat has been masquerading as beef, but that there is a feeling on behalf of the consumer of being duped. 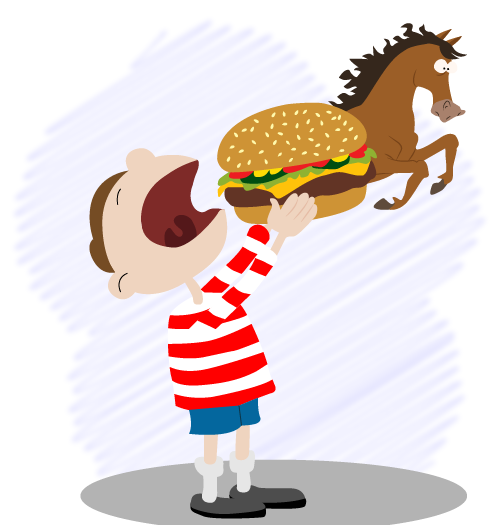 There is still a stigma attached to eating horse, although it is considered a delicacy in some countries. The tenderly nursed image of a happy farm with healthy animals is fictional. In the real world, farms have become industries that work in a mechanical and oftentimes inhumane fashion. Consumers shouldn’t be surprised that they aren’t getting what’s advertised. According to National Geographic, some meats labeled as beef were actually entirely horse. Since pigs are not given the same status as horses, the numbers may not be as disturbing. However, given that pig and cattle are usually processed in the same production line, this may lead to questions about the cleaning methods used by the plant, as well as cleanliness and sanitation. Every time there is a new scandal involving meat, there is uproar, outrage and cries for change. Heartfelt apologies from companies usually follow, with a solemn promise to do better by their customers and learn from past mistakes. The thing is there’s always a new scandal, sometimes with deadly consequences. Take the recent XL Foods E. coli outbreak, which resulted in the largest beef recall in Canada, or the Maple Leaf Foods Listeriosis outbreak in August of 2008. If we want to truly learn from this horse meat scandal, then consumers need to set higher standards for the food they buy. Proper labeling, proper production and proper distribution need to be implemented in order to prevent this from happening again. The only way that companies are going to stop getting away with cheating their consumers is if we demand the right to know exactly what we are eating.